Ah, vacation time. You find yourself with your loved ones on your much-anticipated family getaway. You’ve all been planning this one for months. The children are so excited. You’ve been looking forward to taking a break and spending uninterrupted, quality time together. You’ve got an itinerary full of relaxation, adventure, good food, and unwinding. And yet … you can’t seem to resist the pull of your phone or your laptop. Disconnecting can be challenging for most of us these days. However, you don’t want to squander life’s most precious moments because you just couldn’t let go and unplug from the internet for a while. 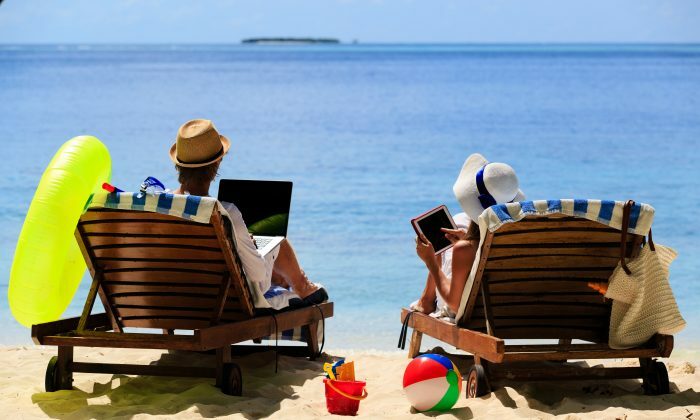 First off, you need to commit to the level of connectivity you’ll maintain while on vacation. Set up a plan and stick to it. Will you leave your laptop at home? Will you leave your phone in your room while out sightseeing? Will you check email each morning, only once during the vacation, never? Push yourself slightly past your comfort zone when it comes to this—aiming to engage with your devices as little as possible during your vacation. Whatever your line of work, give significant advance warning of your plan to disconnect and be temporarily unavailable. You should reach out to key colleagues and clients, giving them the timeframe of your departure and the alternative contacts they should use while you’re away. Set up smart, descriptive auto-response email messages and voice messages that outline the dates you’ll be unavailable, the individual who should be contacted in your absence, and any other details that will allow your mind to be at ease and your business relationships to remain unfettering while you’re away. Author Michael Hyatt recommends setting up an emergency email that you’ll check once a day. Give it only to close family and key colleagues, explaining it is to be used solely for emergency purposes. Schedule a time each day to quickly check the email while on vacation, which will hopefully always have an empty inbox. Remove the most tempting apps from your phone. You know the ones. If you habitually check them more than twice a day, remove the temptation altogether. You can get them right back when you return home. Depending on the industry you work in, you may be able to identify times of the year when work slows down. In the United States, the month of August and the weeks between Christmas and the New Year are very slow times for most businesses. Taking a vacation during this time may help to put your mind at ease that you’re not missing out on anything too important. You’ll never regret taking the time to be fully present with your family and allowing your body and your mind to disconnect from time to time. You’ll return refreshed and inspired in ways you perhaps wouldn’t have otherwise been. What’s more, you’ll model healthy behavior for your children, sending them the message that they are important and meaningful to you and more worthy of your attention than your screens.